I know these are basically diamonds but when they are on point it looks like an argyle sweater. You could easily flip this design over on it’s side for a different look to the diamonds. 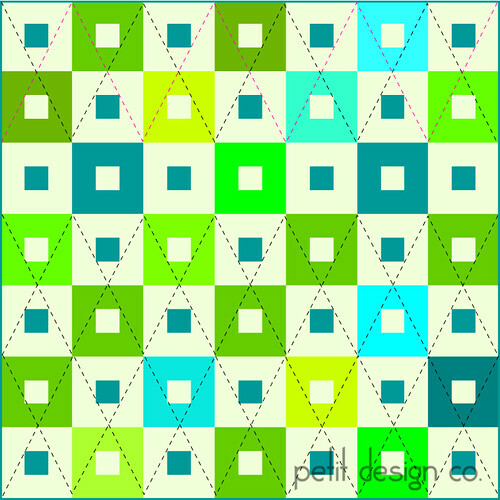 Make this easier by quilting it out in interlocking rows as shown in the top example. This is a great design for wide sashings too. I have added all of the images to a set on Flickr for easier reference. I can't thank you enough for this series. I am really bad with FMQ; and so have a bunch of un-quilted tops sitting in the corner. Now I can finish them. Thank you so much. You are so generous to share with all of us. I agree with Nancy. I can do FMQ but I would rather use my quilting foot for quilting. I love this series. And I agree with both Nancy and Sheila! Thank you so much! Ditto on what the other ladies said! I look forward to your post each day! I am really enjoying your series. I flip back and forth from one post to the next to choose a pattern. Thank you so much! I have come over to your blog from Sew Many Ways. Your quilting tutorials are amazing. thank you so much for taking the time to do that. I am going to use some. I would love to see some inside photos of your camping trailer. how do you fit five in there?